During a recent interview, Dr. Mahmoud Shu‘ban, a professor at Egypt’s prestigious Al Azhar University, made clear that the Copts, Egypt’s Christian minority, will pay the jizya—what is often referred to in the West as an Islamic “poll tax.” According to the Al Azhar professor, “If non-Muslims were to learn the meaning of ‘jizya,’ they would ask for it to be applied—and we will apply it, just like Islam commands us to.” His logic is that, if Christians pay the jizya, they would buy for themselves “protection,” hence why they themselves should want to pay it. Most Western apologists for Islam also claim that jizya money was historically paid to protect conquered dhimmis, though they often imply protection from outside enemies, non-Muslims. In fact, the jizya was/is protection money from surrounding Muslims themselves—precisely Shu‘ban’s point: pay up and maybe your churches won’t be burned and your girls routinely abducted; because you are not paying, you are not protected from such things and have no right to complain. 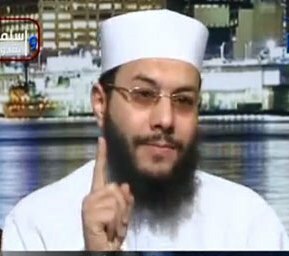 Incidentally, this Shu‘ban is the same scholar who went into hysterics on live TV, insisting that an Egyptian Muslim man who tore a Koran “deserves to be struck by the sword in a public place—and as soon as possible; as soon as possible; as soon as possible!” He is also the same sheikh who recently issued another fatwa on live TV calling for the killing of the leaders of Egypt’s secular National Salvation Front party for being openly critical of Morsi and the Muslim Brotherhood, when all the latter want to do is enforce the laws of Allah. He unhesitatingly pronounced that the “Sharia of Allah” demands their killing, basing his decree on the words of prophet Muhammad—specifically, to behead those who oppose the Islamic leader—as found in the canonical collections ofSahih Muslim. In short, Professor Shu‘ban is one of Egypt’s most frank scholars of Islam. Those who would learn the true, unadulterated teachings of Islam would do well to heed his words, for he never seems to miss an opportunity to expose the things of Islam (for those who have eyes and ears to see and hear with, that is).